One Wine Per Week: Les Impitoyables - Les Miserables to Care For! Using the Eisch Burgundy stemware recently purchased from Domane547 and comparing it to the experience of the same wine in a Riedel Vinum pinot noir glass brought back memories of using some rather unusual stemware many moons ago. In the latter part of the 80’s decade, Robert Parker extolled the virtues of a line of crystal stemware called Les Impitoyables for serious wine tasting. That’s a picture of them you see at the top of today’s post. Les Impitoyables means “the merciless,” or “pitiless,” referring to its ability to magnify the characteristics of a wine to enable a truly serious or critical evaluation of its merits or lack thereof. Glass #1 on the left was meant for young red wines. #2 was for all white wines, #3 for mature red wines, and #4 for sparkling wine tasting and evaluation. Rather than explain the rationale for the various shapes, here’s a link to a store that carries them which also offers the reasoning in the descriptions. I was fortunate enough to be able to try all four of these (back in the 80’s). Did they work? Well, as my fuzzy mind remembers, yes they did. Glass styles number 1 and 2 were particularly effective. Glass #1 with its extra-wide hips and narrow nose promoted a large surface area for the wine to breathe, and the aromas became concentrated as they funneled up to the nose. Tasting the wine also had the effect of focusing the wine on one particular area of the tongue since the opening was so narrow. Think Riedel’s Vinum Extreme series, but even more extreme – extremely extreme! Glass #2 is probably the strangest-looking glass I’ve seen for tasting wine, but it was also quite effective. It also allowed for a fairly large surface area for breathing, and the aromas went up the tall bowl and curled in to the nose. Both of them look more like UFO’s than wine glasses, if you ask me. But from what I can recall, they were indeed great for wine tasting. But they were pretty ugly (#1 and #2, anyway. #3 was more conventional. I never much cared for sparkling wines or Champagne in #4 because the textured glass obscured the bubbles). And #1 and #2 were a big pain to clean and dry. The opening on the #1 glass was so small, and the bowl so wide that it was darn near impossible to clean the inside of the glass if you wanted to do more than just rinse it. The bowl on the #2 glass was so tall that it was difficult to get inside and clean that one, too, even though the mouth was wider. #3 and #4 were easier, but still posed problems. 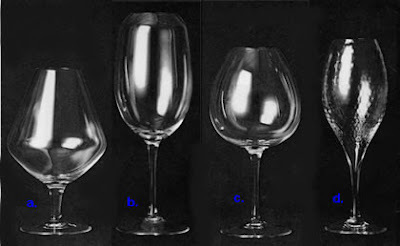 The #2 glass was also not made very well in many cases, with the bowl not being straight on the stem. So if you turned the glass by the stem, you could watch the bowl wobble. It also snapped off fairly easily and the crystal itself was delicate and shattered easily so you had to be extremely careful when washing them. All in all, maintenance was a big pain but they did in fact do their job very well. Well enough to outweigh the hassle of cleaning them? Honestly, I prefer the Riedels. So does that mean I prefer form over function? Again, while it’s been a long time since I tried the Impitoyables, I have the notion that they did a better job that the Riedels when it came to evaluating wines. But the Riedels still do an excellent job plus they win the beauty contest hands down. And are far easier to clean. Now there’s also a couple of Eisch stems sitting in my collection and those are very pretty, too. I’m thinking the larger bowl and opening contributed to the difference in taste I perceived compared to the Riedel stem with last week’s wine, more so than the “breathable” property claimed by Eisch. Plus the Eisch are really easy to clean! So given all this, when we review wines, to what degree are our wine reviews influenced, perhaps unknowingly, by the shape of the glass we use?